In addition to this forum topic, a BL land claim map has also been established (pictured above), which can also be accessed https://docs.google.com/drawings/d/1Xhp5hfHbonm8DttYb1mNMS_r-_RcwLxAw4qr9zlQHgo/edit?pli=1" rel="nofollow - here . The map will be updated whenever new claims are made or older claims are altered. Feel free to make this link available on alliance profiles as well. The image above will be updated in this forum topic as the map changes. BL Alliances: Thinking about claiming lands in the Broken Lands? http://forum.illyriad.co.uk/bl-alliance-land-claims-an-early-guide_topic6448.html" rel="nofollow - first! 05 June, 2015: Added TVM land claim, including their http://forum.illyriad.co.uk/noclaim-land-claims_topic6435_post87260.html#87260" rel="nofollow - claim-free zone . Any newly settled or exodused cities not controlled by T-SC or our confederation members will be removed at our discretion. The Southern Cross will provide aide in the relocation of cities appearing in our area after the time of this claim. If you believe you should be able to settle within our claimed area, please contact http://elgea.illyriad.co.uk/#/Communication/ComposeMail/246685" rel="nofollow - Takeda Shingen , http://elgea.illyriad.co.uk/#/Communication/ComposeMail/262152" rel="nofollow - J.Froelich , or http://elgea.illyriad.co.uk/#/Communication/ComposeMail/241829" rel="nofollow - mjc2 . Cases will be reviewed on a case by case basis. Effective April 08, 2015, http://elgea.illyriad.co.uk/#/Alliance/Alliance/1204" rel="nofollow - The Hashashin (SIN) claimed all land in Fellandire north of y=-2502. Unaffiliated players who accidentally settle into the SIN land claim can avoid removal by joining HALO, SIN's gateway alliance, or Fam. Although confederated with SIN, http://elgea.illyriad.co.uk/#/Alliance/Alliance/1172" rel="nofollow - Fam is a completely separate, non-military alliance with a focus on trade. Any further questions related to the SIN claim, feel free to contact http://elgea.illyriad.co.uk/#/Player/Profile/253086" rel="nofollow - Chandrian or http://elgea.illyriad.co.uk/#/Player/Profile/263810" rel="nofollow - Jejune . You guys should really name these territories. Deathmongers [Death] officially as of June 2nd, 2015 claim Northeastern Pawanallpa as our headquarters east of plot x=810 and north of y=-1778 to the border of Pawanallpa. All established cities in the region will be left alone and not be disturbed in their growth throughout the region. They are welcome to be. Deathmongers just seeks room for our members to grow. Thank you for your time. Jejune, if you could please add this claim to the map. The recent claiming of land in The Broken Lands continent, beyond the traditional claims by sovereignty and the player imposed "10 square rule" has given rise to much discussion within the chambers of TRIVIUM's capital. As an alliance based almost entirely in The Broken Lands, this claim process has caused us to put considerable focus on our own common territory. To ensure we will be able to continue our recovery unhampered, we have collectively concluded that it would be a mistake to forgo a claim. Such a claim, made by a centrally located alliance and with the cities of allied as well as unallied players mingled throughout a territory we are most keen on populating should be well considered as it will likely be deeply scrutinized and could be seen as a touchstone for the regions we occupy. After much debate and discussion among the members of TRIVIUM, as well as talks with the leadership of alliances other than TRIVIUM who would most be affected by our claim, we have decided to present a land claim contained within two zones. The first zone will encompass the most obvious and logical territory that we, as an alliance now occupy. The borders of this first zone, described below will encompass the cluster of cities TRIVIUM has located in eastern Oarnamly and western New Lands. The second zone covers the entire region of Oarnamly and the greater portion of central and western New Lands, also described below. Zone One: All cities located within the borders of this claim as of 21:01 Illyriad Time, June 5, 2015 are exempt from any action on our part. Alliances that maintain a diplomatic relationship with TRIVIUM are asked to negotiate individual exceptions to the limitations of this claim. Players who wish to locate within the claim area are encouraged to contact TRIVIUM leadership to open diplomatic relations. The alliance Murder of Crows, now and in the future will be exempt from the enforcement of this claim. Aside from the above exemptions, TRIVIUM maintains its right to refuse settlement by Teneril Spell, Exodus, siege-capture or settlers. The owning player of any city found within the zone one claim borders, which is not expressly exempted as above, will be contacted by IGM. If, after a discussion between the city owner, or (if they prefer) their alliance leadership and TRIVIUM leadership the city is declared in violation of the claim, a time frame for evacuation will be assessed. All necessary resources for such evacuation will be available for the asking. Should the owner of the city in question refuse to evacuate from the zone one claim area within the alotted timeframe, TRIVIUM reserves the right to impose penalties on the city and/or use whatever means necessary to remove it from the claim area. Zone Two: The territory located within the borders of the zone two claim are to remain expressly claim free. This exclusion includes TRIVIUM as well as all other players, alliances and confederations, allied or not allied to TRIVIUM. The claim free designation places this territory into a protectorate that is administered by TRIVIUM on behalf of all occupant cities, now or in the future within the borders of this exclusionary zone. Any land claim attempted within the borders of this exclusionary zone will be considered null and void. Any land claim enforcement attempted within the borders of this exclusionary zone will be countered by the full force of TRIVIUM. Special Note on Resources: Protecting resources, including basic resources, basic crafting resources, rare resources and dropped arms and armor, as well as any resources that may become available in the future will remain the prerogative of the cities located nearest those resources. It is the duty of said cities to remain vigilant and guard local resources from poaching, or otherwise risk losing control of those. The land claims of TRIVIUM, both phase one and phase two have no concern with respect to resources found upon the land. to latitude -2220 in the south, to the west coast. 3. Fiery Portal of Shadows @ 51|-2171 Beast From Within of Toothless? to latitude -2206 in the south, to the east coast. The Han Dynasty, as of June 12, 2015, lays claim to the western portion of Almenly in two zones as outlined below. This claim is modeled after Trivium's two zone land claim. Han Dynasty had extreme interest in creating a location to which it can centralize, whilst still enabling freedom of settlement to players within Almenly. Zone 1 settlement is restricted to Han Dynasty, and Han Dynasty reserves the right to remove any cities* within Zone 1 that were not within it as of June 12, 2015. Any offending players will be contacted by a IGM. If the city is found to be in violation, Han Dynasty will attempt to work with the offending player to see its removal from Zone 1. If the city is found to be within Zone 1 after the allocated time for removal, it will be subject for forced removal. Zone 2 settlement is not restricted, rather, Han Dynasty does not recognize any land claim within Zone 2. Han Dynasty encourages any player that exists within Zone 1 before the time of this claim, or that wishes to inhabit Zone 2, to contact Han Dynasty. We may be interested in helping the growth of Zone 2 cities. Zone 1: Consisting of land that is currently occupied by the majority of Han members. The natural northern and western borders of Almenly forming our western with the eastern border starting -118 | -2432 and stretching south to -118 | -2700 and then west from there to the natural western border, forming our southern border. Zone 2: Includes the northern peninsula, following along the natural eastern border of Almenly until x -100. The eastern border runs due south of that point, along house Stark's land claim, until reaching -100 | -2759. The southern border of Zone 2 then runs west to the natural western border of Almenly. * Han Dynasty recognizes there are population variations of settlements, which only some are titled as 'cities'. Han Dynasty recognizes all population variations of settlements as a 'city' in this land claim. The official forum profile for Han Dynasty. Effective 18 June 2015 the Roman Empire claims the province of Westmarch west of x=-626, and retains the right of settlement above any other consideration along the borders of that claim. The Fellowship of the Ring is free to continue to settle throughout the claimed region. Players with cities in the claimed region prior to 18 June 2015 have been granted personal and city-specific exemptions. Existing settlements held by these players are free to stay in the region. New settlements by those with this exemption are permissible provided it does not conflict with Rome's settlement plan. Rome's Consuls will provide details of this as necessary on a case-by-case basis. All concerned have already been individually notified of this exemption. If you believe you should have received this exemption and have not been directly contacted please message any of Rome's Consuls. Players seeking to move to Westmarch may also apply for the exemption as detailed noted above. Those currently in the claimed region who wish to relocate their cities outside of the Roman claim due to this new development may accept assistance from Rome in the form of new city site locations outside of Westmarch and basic resources. New players who accidentally relocate to Westmarch in the future will also be offered this support. Players who move into the claimed region who are not members of the Fellowship of the Ring, the Roman Empire, or who have not been granted an individual exemption by Rome's Consuls, will be asked to leave and may be removed by force. Questions, applications for an exemption (which must be approved prior to settlement), and any other concerns should be directed to any of Rome's Consuls. Effective July 23, 2015 Zraznarg's Legion claims the province of Huronire the lands of -491 / -1649 South East to -565 / -1571 North West. Any previous settlements are welcome to stay. However any future settlements must be approved by the Caesar. Any requests or questions can be directed to Zraznarg. 1. A complete proof of no troops present in the city (screenshots of both military page and military movements page) is sent within 24 hours after our first warning. For an exodused city, for 48 hours after the exodus cooldown. For a Tenariled city, for 48 hours after the proof was presented. 3. If the city was settled an exodus or razing arrangement will be negotiated within a 5-day period. Our standard policy of negotiating with players/alliance leaders on individual basis still applies to these alliances and unallied players. I would like to offer my sincere thanks. as a training alliance, leader to Rosie, Shogun and Broken Blades in general, for recognising the limitations that land claims cause newbies within these alliances. Diplomacy as always is key; communication is important ........... Something that I believe is often lacking these days. However, it is great to see that at least some alliances and players maintain common sense !!! Rosie and Shogun? I applaud your positive action regarding training alliances and hope that this follows through and pokes other "land claimers" to do the same. 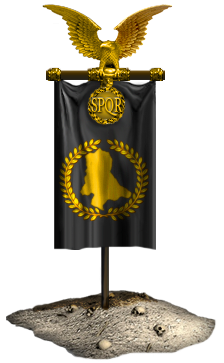 Roman Empire is issuing a statement of change to our land claim policy. Roman Empire considers placement of a None Roman city in our land claim without our prior permission to be an act of aggression unless conditions below are met. 1.Rome wants evidence that the city is completely clear of troops once prove is provided Rome will ask the city in open violation to be moved out of the roman land claim. We will provide time for the exodus cool down for the city to be able to move. 2.If the city was settled an exodus or razing arrangement will be negotiated within a 5-day period. The Fellowship is exempted from the policy also roman empire allies and training alliances. Rome has had no problems and have solved all incursions of cities into our land claim peacefully and intends to do so in the future. 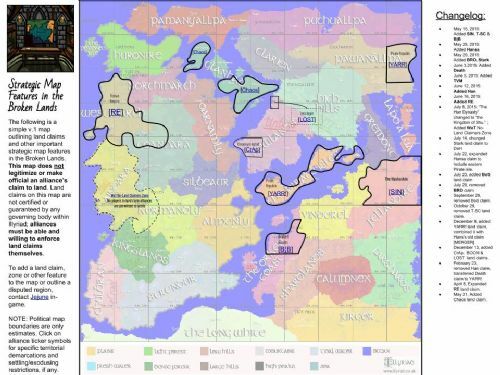 First, the EE PAC on the Pirate Isles was made up of cities that are now in The Pirate Kings alliance, and thus the EE portion of that cluster is down to a single city. The Pirate Kings, like Kings throughout the ages, want to establish a Kingdom. As such, we are taking the obvious step of claiming the larger of the Pirate Isles, a heavily forested and largely rough land, (the one not part of the Hansa claim) for our own. We would like to further announce that through our Confederation with The Hanseatic League, we are offering our support of their land claim, and offer to help enforce any, ahem, negotiations with interlopers. Additionally, as we are first Pirates and secondly Kings, we want it further stated that our claim extends to the seas on all sides, 100 squares or to the further shores, whichever is closer. While this means nothing for gameplay purposes, it is very much in the spirit of our alliance identity to aim for control of the seas. Our landclaim means two things – existing residents, and members of Hansa, are welcome to continue their growth in our area without interference, subject only to the common provisions of the 10 square customs. Others who move into the area past the date of this announcement, will be enticed to move, whether by carrot or by stick. This is not a fertile and bountiful land, and living here requires robust settlers, so we expect only those with our support to survive in the area. Finally, cities without growth in a 4 week period will be subject to housekeeping removal. We will make any governing alliance aware in advance, should they be able and interested in taking the city within a reasonable amount of time, but dead cities will not be allowed to sit and rot in the landscape. One alliance, more pirates, extra land, huzzah! All cities currently within the bounds of this area are granted exempt from the terms of this claim. However, in the event that exempt cities are exodused out of the claim, or if any exempt cities disappear due to player abandonment or by other means, the former location of the city is no long exempt, and no city will be allowed to replace the former exempt city except by the permission of Chromium Aphid. The intent of this claim is to provide a compact, desirable space for Chromium Aphid to concentrate its cities as it grows. The majority of all Chromium Aphid cities are now located within this claim. Chromium Aphid reserves the right to settle their cities within the claim as they desire, and expect the alliances represented by the exempt cities to grant temporary confeds to Chromium Aphid to allow the placement of cities within the 10 square minimum. The terms of this claim prohibit the harvesting of any resources within the claim, except by the express permission of Chromium Aphid. Warfare in the claim without the express permission of Chromium Aphid is not permitted. Any armies camping in the claim, including siege armies, without permission will be attacked without warning. Chromium Aphid reserves the right to conduct itself within the claim as it sees fit, including the use of military and diplomatic forces to maintain order through intelligence-gathering and threat neutralization. Cities appearing in the claim without permission (exodus, tenaril, settling) will be given seven days to relocate. Failure to relocate in that time will result in Chromium Aphid sieging the city to raze. Anyone wishing an exemption to this claim must apply to Chromium Aphid for consideration. Suicide Squad has also decided to lay a claim within the Newlands. We will treat any breach of these borders as an immediate act of aggression and respond accordingly. Sending troops within these bounds for laying claim to resource sites such as minerals, hides, animal parts, herbs, and any rare resources that may come to spawn in these bounds. We understand we are a small alliance and that this land claim is relatively small. But We view it as a step towards joining the larger community and establishing ourselves more solidly within a highly valued area. Players moving close to Lost Again [LOST] land claim will make allowance for a 10 tile 'no-man's land' extending outside the perimeter of the land claim borders. Lost Again [LOST] Reserves the right to modify its borders at any time as it sees fit. All cities currently within the bounds of this area are granted exempt from the terms of this claim. However, in the event that exempt cities are exodused out of the claim, or if any exempt cities disappear due to player abandonment or by other means, the former location of the city is no long exempt, and no city will be allowed to replace the former exempt city except by the permission of Lost Again (LOST). The intent of this claim is to provide a compact, desirable space for Lost Again (LOST) to concentrate its cities as it grows. The majority of all Lost Again (LOST) cities will be located within this claim. Lost Again (LOST) reserves the right to settle their cities within the claim as they desire, and expect the alliances represented by the exempt cities to grant temporary confederates to Lost Again (LOST) to allow the placement of cities within the 10 square minimum. The terms of this claim prohibit the harvesting of any resources within the claim, except by the express permission of Lost Again (LOST). Warfare in the claim without the express permission of Lost Again (LOST) is not permitted. Any armies camping in the claim, including siege armies, without permission will be attacked without warning. Lost Again (LOST) reserves the right to conduct itself within the claim as it sees fit, including the use of military and diplomatic forces to maintain order through intelligence-gathering and threat neutralization. Cities appearing in the claim without permission (exodus, tenaril, settling) will be given seven days to relocate. Failure to relocate in that time will result in Lost Again (LOST) sieging the city to raze. Anyone wishing an exemption to this claim must apply to Lost Again (LOST) for consideration. Taken and edited from Chromium Aphid land claim with thanks. Glad your leaving Arran alone. You don't need to follow land-claimers self-imposed rules. Just ignore them. These players want war and PvP. Anti land claimers are who were late to the idea and feeling cheap if they were now going to claim lands. Anti- land claimers are no different from land claimers. asr is being blithe. it is safe to ignore land claims if one believes either that the claimers are bluffing about their ability to defend the claim, or if one commands sufficient strength to defend oneself against an assertion of the claim. that is to say, one can be somewhat dismissive of these latest claims by individual players if one is a member of a top ten alliance with a military tradition and a support for one's dismissive attitude (asr). it is considerably less wise for smaller, newer, less well supported players to do so unless they intend to be martyrs to the cause. Effective as of May 21, 2016, https://elgea.illyriad.co.uk/#/Alliance/Alliance/1600" rel="nofollow - Chaos [Chaos] claims the westernmost island and the easternmost island of Glanhad. We hereby declare a no-claim zone on the middle islands of Glanhad. Any further questions related to the Chaos claim, feel free to contact https://elgea.illyriad.co.uk/#/Player/Profile/331566" rel="nofollow - Azhag the Slaughterer , https://elgea.illyriad.co.uk/#/Player/Profile/324420" rel="nofollow - ALONE , or https://elgea.illyriad.co.uk/#/Player/Profile/336529" rel="nofollow - Lifeless . The https://elgea.illyriad.co.uk/#/Alliance/Alliance/1703" rel="nofollow - Phalanx  hereby claims the following https://elgea.illyriad.co.uk/#/World/Map/629/-2470" rel="nofollow - 51x51 land in Vindorel *. We reserve this area to create Illyriad's first PvP arena, http://illywarmonger.blogspot.com/2016/12/announcing-thunderdome-pvp-arena.html" rel="nofollow - Thunderdome . This land claim excludes permanent settlement. Any player from any alliance who wishes to relocate and fight is welcome here, as long as they obey the Laws of Thunderdome. Please refer to our https://elgea.illyriad.co.uk/#/Alliance/Alliance/1204" rel="nofollow - profile page for more information. Thanks! Effective Immediately starting 5-22-18 The RE Coanhara land claim will be mutually shared between RE,REBEL and IRON. Any third parties interested in settling within our land claim must contact a leader of either alliance.